I'm getting some nice press in the local newspapers regarding the question of my "authenticity" as a Republican. I think I've been pretty open about my somewhat adversarial relationship with the party hierarchy of the state and county Republican Party apparatus. This has often been misinterpreted, unintentionally I hope, as hostility towards the party's voters and the party's values. It IS a misinterpretation. I bear no animosity towards Republicans and I believe that many members of the Republican Party hold libertarian values, values which we share and which are very important to me. My opponent would have you believe that because of his party registration with the State of Delaware and his refusal to talk to people associated with the Libertarian Party, he is the more authentic Republican. Let me tell you a little bit about my history in politics, and you can decide for yourself whether it is your party registration or your actions and the values that you carry with you that define who you are. When I first became interested in politics, George W. Bush was president and we were going to war in Iraq. I was skeptical of the justifications for our invasion and even more skeptical of our "plan" for the aftermath. I was skeptical of the rhetoric the president and the Republicans controlling congress used, implying an outsized role for the Federal government beyond that which should be the role of a national, central government. Democratic politicians were no better, but they didn't run things and that allowed them the convenience of pretending to care about civil liberties and open government. So I registered as a Democrat. Had to to vote in their primaries, can't say I necessarily supported their candidates in November though. Think about it. If you are only going to be allowed to vote in one of two taxpayer funded primaries, why not vote in the one too weak to win based on what they've BEEN doing, especially if being out of power suddenly makes them care about the majority (not them) overreaching and abusing civil liberties and government process? I mean, this is a two party system isn't it? You have to pick one or the other, right? I didn't write the rules, I just follow them. Of course, I was young and naive, and was just a single voter who didn't even realize that there were two DIFFERENT primaries in Delaware, one for president and one for everything else (this year on September 11th!). I didn't have much of an impact before power shifted and before the Republican Party got itself an infusion of liberty through the 2008 campaign of Ron Paul. By the time I realized I wanted to vote for him, the registration blackout had passed and it was too late for me to change my party registration to Republican, but I did it after the 2008 election and hoped that there would be a libertarian leaning Republican like Ron Paul in the 2012 presidential primary I could support. In 2010 I became involved with the Libertarian Party of Delaware. They had a strategy of establishing an independent block of legislators not answerable to either of the two major parties, two major parties which had demonstrated that despite some libertarian tendencies, they were NOT libertarian. The Libertarian Party was eager to bring new people into the political process and educate them in the ways of politics. Not only did I become their nominee for the 32nd Representative District (the same office I'm running for now in the Republican Primary), but they also elected me Kent County Chair and a national convention delegate. 2010 was fun, I learned a lot, and considering how much we knew and that we were running under a Libertarian-Independent fusion nomination instead of one of the "two party" ballot lines that get all of the press attention, I was happy with 6.1%, but obviously a different strategy for electing libertarians would be needed in the short term to shift the inertia of the electorate and the multitude of institutions responsible for selecting and promoting their election choices. The major parties must themselves be reformed or supplanted. Alternative Parties should operate as special interest groups with ballot access, encouraging and engaging in primaries when they can, nominating their own candidates when they can't. I was elected Vice Chair of the Libertarian Party of Delaware in 2011 on a platform of engaging the Democratic and Republican Parties on their home turf, in their primaries. As the year progressed and the GOP presidential primary field coalesced, the vast majority of Delaware's registered and active Libertarians preferred Ron Paul. Many of us changed our party registrations and assisted with the circulation of petitions among registered Republicans to secure Dr. Paul's ballot access in the Republican Primary. Many of us engaged in the Republican committee meetings ultimately responsible for selecting the state and national delegates sent to Rehoboth in April and Tampa this week. I was a state delegate in Rehoboth and put one of the US House candidates into nomination for the convention's endorsement. 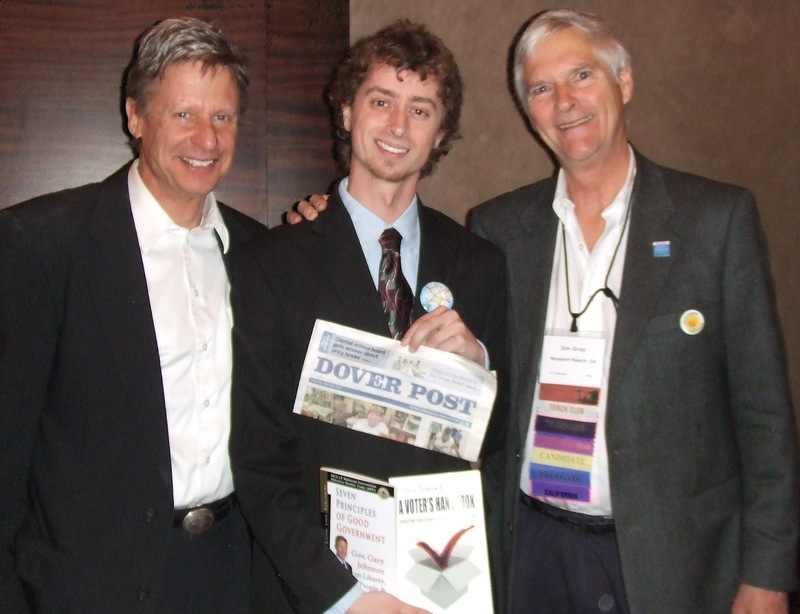 Many of us also supported Governor Gary Johnson, who was also a candidate in the Republican primary even though he was often excluded from debates and given no attention by major TV news outlets. He will now be on the ballot in November as the Libertarian nominee along with Judge Jim Gray. I was a registered Republican heavily engaged in the presidential primary process, attempting to align the preferences of the Libertarian Party and the Republican Party, so that we could work in coordination to reduce the size of government and protect the civil liberties of the people. I stayed involved with the Republican Party. I have also stayed involved with the Libertarian Party, even though I resigned my position as Vice Chair in what has turned out to be a vain effort to get my opponent to agree to a debate about values instead of party registrations. I have also formed a number of new political parties, on paper anyway, at the Department of Elections. Party registrations aren't important. Your values and your actions are. I believe that I share the same values as many Republican Party members, values which have been ignored by Republican Party politicians and party leaders. I have been involved with the Republican Party, attending their meetings, and working in their primary elections. If you care what letter I put next to my name on a day to day basis at the Department of Elections, there's a link to my opponent's website (his real one!) on the right side of the screen. If you care about the values I care about, if you care about changing the way Dover runs Delaware, I hope you'll support me on the 11th of September at your local polling place, maps are linked right here. Will, I think everyone knows you have said very degrading things to Republicans while you have stated to be one and running as one even though you're running as one...whatever. That's your choice. It doesn't give Republicans much hope that your are going to be their voice...that's a big problem. You also do not stand for what the majority of Republicans stand for...another problem. You stand for what Libertarians stand for...not a problem. Btw, what does the V for Vendetta stand for in your slogan anyway? Just wondering? I think the majority of Republicans in the 32nd district will make the determination as to what they stand for on September 11th. I'm not entirely sure I followed the rest of what you're saying, but I HAVE been a voice for Republicans already through my service as a delegate to the 2012 state convention in Rehoboth. I have also said degrading things about the functioning of the Republican Party and the actions of Republican politicians, but I do not insult Republicans, except perhaps unintentionally. As I've said repeatedly, if people are happy with how their party has been functioning, if my association with the LP is a problem, there's a link to your father's website right there on the side bar and I'm going to lose the primary. I can live with that. On the other hand, if the GOP is being run poorly, if the politicians they come up with are ineffectual, and if Republicans really don't have a problem with libertarians like you do, I just might win. Wouldn't that be interesting? The "V" stands for "Vendetta" it would seem. I know V stands for Vendetta...who is your Vendetta against though? Also another question that has been running through my mind is why do so many of your signs have no affiliation to any party? It only says Vote Will McVay for Delaware. Also, you state that your views align with the Republican Party. Really? What do you think of the platform that the GOP just OK'd a few days ago? I can't see that you would agree with 95% of it. So, how can you say that your views align with them?
" if Republicans really don't have a problem with libertarians like you do, I just might win. Wouldn't that be interesting?" I don't have a problem with libertarians as you think I do. I have a problem with you misrepresenting yourself as a Republican. Or a Democrat. Or a Libertarian. Or even a Jedi Knight. I don't even a problem with Democrats either. I believe in our governmental system. I don't appreciate people who seem to like to make a mockery of the system that has kept our country going for hundreds of years. This video is the point of the reference. Mostly I just think it looks cool. Kind of like your gavel. It's marketing. I think one of the reasons we have many of the problems that we do is because our political system has grown stagnant. People are too hung up on party registrations. It makes a mockery of itself. I have been involved with the GOP, I have served as a state delegate to the convention, I think I agree with Republican voters in the 32nd district to a large degree even where I differ with the national platform. I think most of them also care more about issues than party registrations. I think most of them are capable of understanding that a party registration at the Department of Elections is meaningless if you don't carry anything else with you. Why don't we talk, specifically, about what kind of legislation you think that your father would introduce, promote, oppose, or hold up that would represent the 32nd district better than I would, be they Republicans, Democrats, or something else entirely? I'd have preferred to have such a conversation with him directly, but if the best we can hope for is a surrogate, so be it. Well, this is where we are going to have to agree to disagree, Will and part ways because we could go on for eons back and forth like this. Unfortunately (or fortunately depends on the way you look at things), I don't have that kind of time. Now as to having a conversation as to what my father would introduce, promote, oppose, etc, I guess that would be up to him. As I have told you before, I don't speak for him; I speak for myself. I have my own mind; my own thoughts and opinions. I see that you've already shared this with others as "My opponent's campaign responds". I am conversing with you as someone who is just Monica, not as a part of my father's campaign. Sorry to disappoint you. That is disappointing. I still consider your comments a valuable insight into his thinking, in the absence of any other communication. I have hoped for a conversation with him since he first filed.